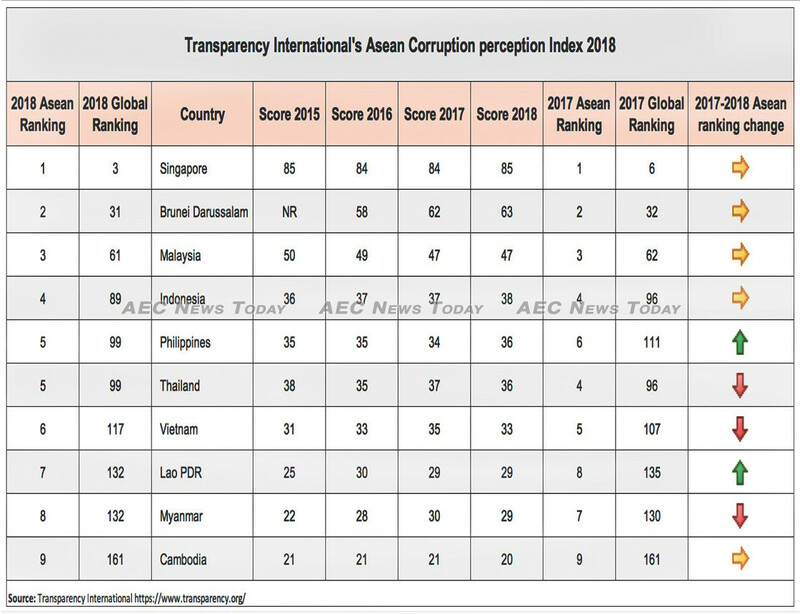 The annual report on state-level corruption by Transparency International contains few surprises for the Asean region. Singapore is still regarded as the nation with the least corrupt public sector in the region, while the kingdom of Cambodia once again brings up the bottom end of the list. That’s not to say things haven’t gotten better, or worse. 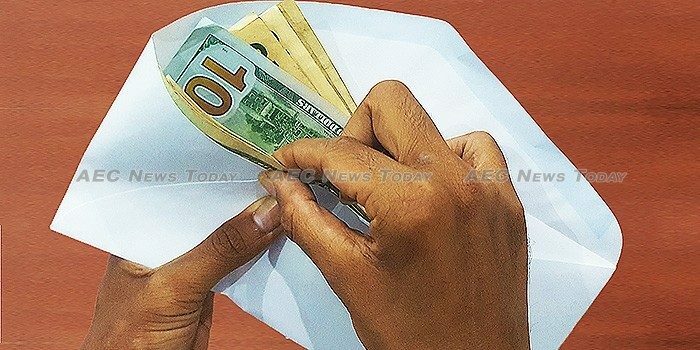 Six Asean member states — Brunei Darussalam, Indonesia, Lao PDR, Malaysia, the Philippines, and Singapore — saw their ranking in the Corruption Perception Index (CPI) 2018 improve. The remainder, excluding Cambodia, saw a fall. Experiencing the biggest improvement in perceived corruption in the public sector was the Philippines, which saw it’s global ranking improve 12 places from 112 in 2017 to 99 last year. Also heading in the right direction is Indonesia, which saw its global ranking jump seven points from 2017 to finish 89th globally last year, retaining its rank as the fourth least corrupt nation in Asean for another year. Taking third place in Asean is Malaysia, which saw a negligible one place improvement year-on-year (YoY) in its global rank to 61, 30 places behind Brunei Darussalam which experienced a similar one place improvement on its 2017 rank to retain its second place in Asean and 31st place globally. Unchallenged as the nation with the perceived least corrupt public sector in the region is Singapore, which saw its global ranking improve from six in 2017 to three in the latest CPI. That, however, is the end of the good news. In Thailand, where a military junta that vowed to stamp out corruption has ruled for almost five years, the level of perceived corruption increased from 96 in 2017 to 99 last year. In neighbouring Vietnam, where the government has mounted a very public anti-corruption drive with some high profile trials, the perceived level of corruption tumbled 10 places YoY, the country ranking 117 on last year’s CPI. Myanmar also saw it’s global ranking drop two places, from 130 in 2017 to 132 last year. 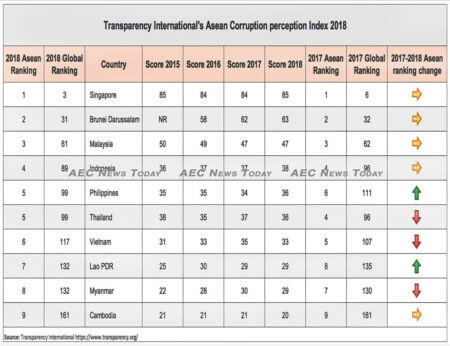 Spinning its wheels in the sand and apparently finding no solutions to corrupt practices, Cambodia saw its global ranking remain at 161, scoring just 20 points, a one point drop over its score for each of the previous four years. The CPI uses a scale from zero, for highly corrupt, to 100, for very clean, to rank countries and territories based on 13 categories and expert assessments, which measures the perceived level of corruption in the country’s public sector. The CPI score provides an aggregate indicator that combines different sources of information about corruption, making it possible to compare countries. The Corruption Perception Index 2018 ranks 180 countries.